Wednesday and Thursday were spent having a little Hua Hin relaxation just sitting by the seafront and not doing anything special in the day and just wandering about the town in the evening. On the Thursday evening we ate Fish and Chips at the Hua Hin Brewery Co. This is a nice restaurant at the front of the Hilton Hotel with seating outdoors on several levels. 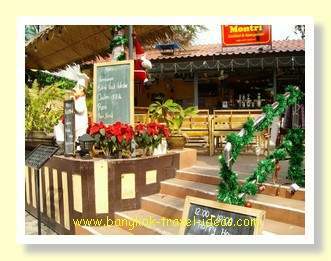 Being just before Christmas all the waitresses were dressed up in Santa hats and most of the other patrons were enjoying a little Hua Hin relaxation. As usual people were pretty friendly and I managed to get a photo with one of the ladies we were talking to, about of all things hair extensions and backcombing. Being attached to the hotel, they have a Western menu selection and Fish and Chips with a couple of drinks cost 850 Baht, so it was very reasonable. 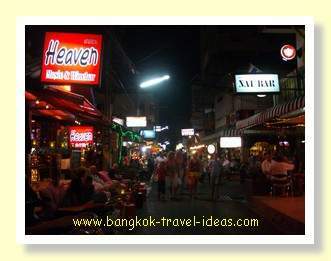 Hua Hin has a maze of streets just back from the water and therein lies a range of beer bars, restaurants and general night life activity. Many of the bars are owned by expats and so you will find Dutch, German and English bars amongst the many and if the soccer is on the all the televisions will be tuned to the sports channel and most people will have beer and be cheering along. To get back to our hotel we had to pass through this area and so we stopped at one place for a game of Pool and a quick drink. There is no charge to play Pool but you put your name on the whiteboard and you play the winner of the previous game. As most people are on holiday and from different backgrounds, just confirm what the agreed penalty shots are, so there is no disagreement later. There seem to be two choices in the case of a foul. Either you take two shots from base line or place your ball anywhere on the table and take one shot. Other than these two variations, the rules of Pool seem to be pretty well understood and it is a fairly social game as people are there just to have fun and enjoy some traditional Hua Hin relaxation. If you are interested in staying at Hua Hin or Cha Am hotels you can review this Agoda link to Hua Hin Hotels or you can read more of my Hua Hin holiday blog below. Everything comes to an end and ultimately it means returning to Bangkok. 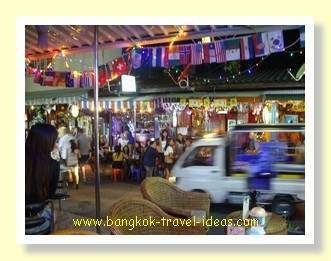 Catch up with an old friend and go for a seafood dinner in Bangkok near to Seacon Square. 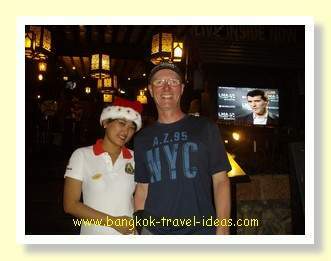 Is Christmas Day in Bangkok any different to your Christmas Day? Travel to the central town of Nakhon Ratchasima and visit the close by attraction of Khao Yai National Park; wander the narrow streets or take a ride in an old style sarm-lor.